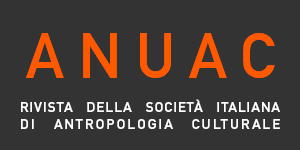 Anuac is the international peer-reviewed open access journal of the italian society of cultural anthropology (SIAC). Anuac fosters and promotes the circulation of anthropological knowledge and publishes original research contributions in all fields of social and cultural anthropology. Papers submitted have to be original and not be under consideration elsewhere. Anuac publishes articles, essays, research reports, themed sections, review articles, single book reviews, film reviews, museum and exhibitions reports, interviews and other contributions focusing on topics relevant to anthropology. Anuac doesn't charge article processing charges or submission charges. Submissions are first evaluated by the Editor-in-chief and by members of the Executive and Advisory boards. If the manuscript is considered suitable for publication several referees based on their expertise are identified. Each manuscript is reviewed by at least three referees under a double-blind peer review process, where both the referees and the authors are kept anonymous. To ensure timely publication, referees are asked to complete their reviews within one month. After collecting the referees' reports, the Editor-in-chief will decide whether the manuscript is accepted (with minor or no changes), needs to be revised and resubmitted, or is to be rejected. Anuac publishes two issues per year (June and December). Anuac utilizes the LOCKSS, system to create a distributed archiving system among participating libraries and permits those libraries to create permanent archives of the journal for purposes of preservation and restoration. Anuac is experimenting the National legal deposition and long-term digital preservation service. Within the project the persistent identifier NBN (National Bibliographic Number) is assigned to each article.